The new Maxxyz Wing System extends the Maxxyz’s functionality and gives you the ability to customize and add more direct access to your console. 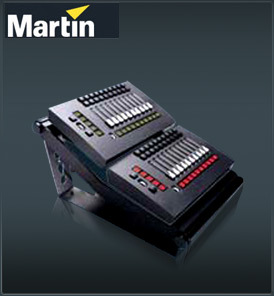 The Playback Wing, shown here, consists of two Playback Modules used to add 20 motorized faders with 20 LCD buttons, extending the playback capabilities of Maxxyz, plus 10 additional LCD buttons which are customizable for easy navigation. The Maxxyz Wing System is a functional and flexible solution which as further options become available, makes it possible to combine different modules in the same Wing Frame - thereby customizing it for a specific application. Modules are easily connected directly to the Maxxyz’ rear panel or to a USB port on a laptop/desktop computer and used in conjunction with the Maxxyz PC, which will be released towards the end of 2004. The Maxxyz Wing System can be placed on the left or right side of the main console. Multiple Wings can be placed on both sides of the main console, to give you the ultimate customized solution to your show. Use of multiple Wings is simple, as each is connected to each other, and simply linked together for further functionality.